This is Barr's second time as the nation's top law enforcement official. William Barr was sworn in as attorney general Thursday in the Oval Office, with Chief Justice John Roberts administering the oath at a ceremony closed to news cameras. His swearing-in came just hours after the Senate confirmed Barr, President Donald Trump's nominee, by a 54-45 vote. 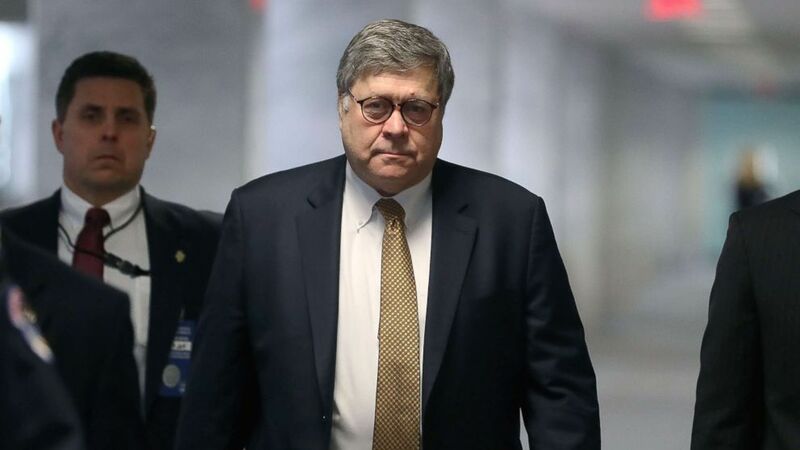 Barr now will head the Justice Department during a pivotal time, overseeing special counsel Robert Mueller's investigation into Russian interference of the 2016 presidential election. The Senate vote fell roughly along party lines, with a majority of Democrats opposing his confirmation. Democratic Sens. Joe Manchin of West Virginia, Krysten Sinema of Arizona, and Doug Jones of Alabama broke ranks and voted in support of Barr. GOP Sen. Rand Paul of Kentucky was the sole Republican to oppose his confirmation. Sen. Dianne Feinstein, the ranking Democrat on the Senate Judiciary Committee, which has oversight of the DOJ, blasted Barr's confirmation in a statement Thursday. “The Justice Department needs a leader who will be independent of the White House and who is able to stand up to President Trump. Bill Barr hasn’t demonstrated that he would be that independent leader," Feinstein said. "His view on executive power–essentially saying the president is above the law–and his refusal to commit to releasing the Mueller report, or protecting other investigations that implicate the president’s interests are especially troubling," she said. Judiciary Chairman Sen. Lindsey Graham characterized Barr as an "outstanding" pick to head the agency. “He is a steady hand at a time of turmoil and he will bring much-needed reform to the Department of Justice," Graham said in a statement. "I look forward to working with Mr. Barr on the many issues facing the men and women of the Department of Justice and our nation as a whole." (Mark Wilson/Getty Images, FILE) Attorney General nominee William Barr arrives on Capitol Hill, Jan. 29, 2019, in Washington, D.C.
Barr previously served as attorney general under President George H.W. Bush from 1991 to 1993. It's no surprise that Democrats largely voted against Barr - mostly because he declined to commit to releasing the full report expected from special counsel Mueller. “Unfortunately, Mr. Barr would not commit to providing special counsel Mueller’s findings and the final report to the Congress,” Feinstein said earlier this month in opposing Barr’s nomination in committee. Feinstein and other Democrats also raised concerns about a memo Barr wrote detailing his views on a potential obstruction of justice charge against President Trump. In June 2018, concerning the president's firing of then-FBI director James Comey in May 2017, Barr argued to Deputy Attorney General Rod Rosenstein that any obstruction of justice inquiry into Trump based on the firing would be "fatally misconceived." "I wrote the memo as a former attorney general who has often weighed in on legal issues of public importance, and I distributed it broadly so that other lawyers would have the benefit of my views," Barr said in his opening statement during his confirmation hearing last month, addressing the controversy head-on. Republicans say that Barr is the right person for the job. GOP Sen. John Kennedy of Louisiana said that nobody should think Barr is a "political hack," but instead said that he reveres the law.